1) Why is monitoring so important for productions? A new customer base of content creators, along with consumers of that content, have discovered just how important quality is when it comes to video products. Companies that make professional products are now seeing the emergence of a market partly driven by the need for affordable solutions for users relatively new to creating quality video, as well as for the expanding online broadcast and streaming market. 2) How have monitoring needs changed to keep pace with the evolution of production cameras? The video production market has moved toward cameras that are more accessible and powerful, with much smaller footprints. The industry as a whole has matured from a linear world of film- and tape-based capture to file-based, non-linear digital capture. With this evolution, the need for more compact devices, with quicker, more efficient and cost-effective monitoring capabilities that can capture higher resolutions, such as 4K, has become paramount. Just as cameras have become lighter and more portable, without sacrificing features, so too must monitors, especially those mounted on cameras and used in field productions. The cost of monitoring products should also reflect the dramatically lower prices of acquisition devices, such as DSLRs and the latest generations of lower-priced professional cameras. 3) What are the basic requirements of a suitable on-camera monitor? Image resolution is fundamental to any video monitor, and therefore one of the most important considerations. The size of the display and its pixel density are also critical. Additional key elements to consider are the tools essential to monitoring video. Basic functions should include tools that help with focus, exposure, color balance and framing. Also, any good monitor should feature false colors, zebras, peaking, zooming, frame guides, Look Up Tables (known as LUTs) and various scopeshistogram, waveform and vector scope. For on-camera applications, it is also important to evaluate weight, robustness, battery consumption, angle of view and sunlight readability. Any great monitor must also feature a responsive and simple-to-use interface to meet the demands of fast-paced productions. With lighting variations and actors constantly moving between marks, a focus puller or camera operator must be able to react quickly to capture the shot effectively. Finally, modern monitors must have a price point that reflects todays lower-priced cameras. 4) Why is having recording abilities within the monitor so important, and how does 4K play into this? For decades, those working in the video production industry understood the benefit of having quick access to a days work. Not that long ago, they also discovered the benefits of using SDI video feeds to monitor work visually, often with immediacy. Among other benefits, this allows them to catch mistakes, such as, for example, when a boom mic falls too low into a shot. Just as the introduction of HD in the film business was an opportunity for the video-assist crew, the current increase in picture quality associated with 4K demands more from operators, which presents its own set of challenges. To capture 4K, users must have the ability to store larger amounts of data, because 4K literally comprises four times the amount of data used by standard HD video. The main concerns that arise from 4K recording are accessibility and affordability, as well as the speed and reliability needed for its high-data rates. Affordability cannot be understated, as readily available consumer storage mediums that are fully capable of recording continuous, high-data-rate 4K video are a key factor. 5) What is the next step for monitoring? With todays on-camera monitors, the competitive video and motion-picture production industries now have a more complete package than ever before. End users can now expect features and functionality that would have required multiple larger, more expensive products just a few years ago. What should already be part of the package? The ability to record in a variety of formats, a full suite of monitoring functions, top-of-the-line audio-recording and media-transfer options and more, including a small form factor and an affordable price. As cameras continue to evolve, so will the on-camera monitors used with them. Like many other technologies in our industry, continued usability and a streamlined workflow are the wave of the future: How can we continue to do more, while adding features and functionality to an increasingly compact package? 6) How did an audio company get into monitoring? Its been a steady progression. The Sound Devices 7-Series played a big part in production audios completion of the transition from analog to digital file-based workflows. The industry didnt just require an audio recorder that records video, but a video recorder that records pristine-quality audio. PIX, a new line of professional video production tools, arose from this need. This series of products, which is now part of the Video Devices brand, was born in part from end-user requests for an SDI input on Sound Devices 788T audio recorders in order to distribute audio. Our developers already had vast knowledge of file-based workflows and timecode synchronization for synching picture to sound. They understood the limitations of in-camera audio quality, and had gained expertise in recording and writing digital data to drives and solid-state memory with audio recorders. At the end of the day, data is just a stream of ones and zeroes, regardless of whether the data captured is audio or video, so the progression from audio to video development was a natural one. Though not designed primarily as a monitor, the now-established portable PIX 240i had a high-quality LCD monitor, which gave camera operators the ability to visualize and frame an image. Since then, a mix of research, customer feedback and industry demand from several renowned cinematographers has directly influenced the development of the next generation of Video Devices PIX products. Taking into consideration the changing production landscape, Sound Devices created a high-quality monitor with a price point that reflects the lower-priced cameras in use today by a broader range of users. The result is the PIX-E Series of high-quality, slim-line monitors with 4K recording capabilities. 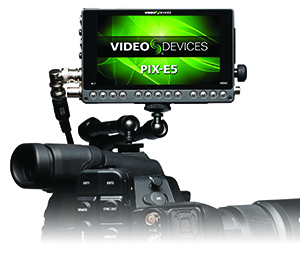 The PIX-E7 is suitable for larger camera rigs that require more detail and screen space. The PIX-E5 and PIX-E5H are better suited to DSLR mirror-less camera rigs and smaller form factor cameras. Between audio, video and now monitoring, a complete, affordable small-form-factor package that can record 4K was the natural next step for today and tomorrows production needs.